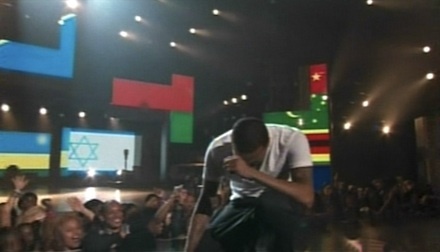 Chris Brown performed a tribute to Michael Jackson at the Black Entertainment TV (BET) Awards on Sunday (June 27). The singer was introduced on stage by Jackson’s brother Jermaine, and attempted the moonwalk during his emotional medley of songs. Jackson died a year ago last Friday (June 25) at the age of 50. Brown also collected the Fandemonium award during the ceremony at the Shrine Auditorium in Los Angeles. Other winners last night included Alicia Keys, Drake, Beyonce and Prince, who collected the Lifetime Achievement award. Kanye West also performed his new single ‘Power’ at the ceremony.